CLEVELAND - They're considered wimpy little holes that everybody can birdie, the skinny guys on the beach that everybody feels like kicking sand at. You're having an awful round, and you just want to take all of your frustrations out on these holes and reclaim some blood lost. The holes we're talking about are par-3s, but they're not all pushovers. A lot of times, golfers scan the scorecard for these holes and anxiously await their shot at a hole-in-one or dramatic birdie. But the following par-3s are some of the toughest in the Cleveland area. Instead of puny little punks waiting for a pounding, they're more like muscle-bound maniacs looking forward to wrapping a club around your neck. Some of your worst nightmares pale in comparison to these stress-inducing turf terrors. No. 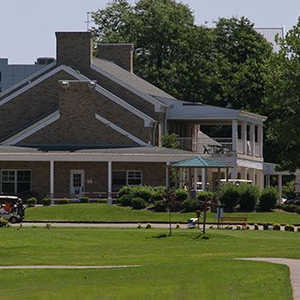 2 at Sleepy Hollow Golf Course, Brecksville. Golfers who play this course each year walk away from No. 2 scratching their heads. They took all winter devising a new strategy to play the hole, but still walked away with a 5 or 6…or more. The thing about this hole, which can play 240 yards from the tips, is that it's almost more important for your ball to finish under the hole than to reach the green in regulation. Those who end up doing the "I love what you do for me, Toyota!" leap after hitting the green don't know what they're in for. If your ball finishes above the hole, you can almost guarantee yourself a three-putt. "No. 2 is tough because of three elements: it's 240 yards from the back tees, the green has a steep tier to the back half of it, and there is a hazard just right of the green," says John Fiander, head PGA professional at Sleepy Hollow. "I would recommend for most players to aim for the left side of the green and away from the hazard. For the average player, I'd say approach this hole as a short par-4 and be happy with a three but expect a four. And you must take the hazard out of play to guard against making five." No. 11 at Grey Hawk Golf Club, Lagrange. 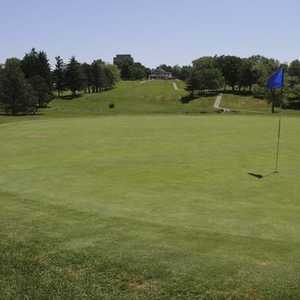 This is one of the few island greens in the area, so it deserves recognition…and demands respect. Most linksters will probably play this hole at 148 or 164 yards, but it can play 180 from the tips. No matter how easy you make it on yourself distance-wise, water as far as the eye can see is never a good pre-shot mental image. A bunker in front of the green offers a measure of safety, but your ball may never even get that far if you misjudge the wind, which has a tendency to blow in on this hole. No. 17 at Boulder Creek Golf Club, Streetsboro. Even though this hole isn't very long, the island green makes up for it…and looks as small as a dinner plate when you're standing so high above it. It can play up to 176 yards, but most Joe Hackers will probably play it at 120. Unlike the island green at Grey Hawk, this one offers safe havens in bunkers, one placed in front and two behind the green. But it's almost more intimidating because of the drop in elevation. If I was a ball, that's the hole I'd pick to succumb to an aquatic doom. No. 17 at StoneWater Golf Club, Highland Heights. Director of Golf Matt Vaca says this hole is so tough, the USGA decided to use the gold tees for the U.S. Open qualifier. Sissies! From there it plays a mere 218 yards. If the PGA Tour ever paid a visit, maybe they'd play it from the tips - at 247 yards! That's even longer than Sleepy Hollow's famous par 3. What makes this hole even tougher is the wind: "It plays into the wind six out of seven days of the week," Vaca says. "It's not the friendliest way to close anybody's round." No kidding. Water on the right side starts about 100 yards from the green and goes almost all the way to the front. Two large bunkers guard each side of the undulating green like bouncers flanking the entrance to a trendy nightclub. If you can get the ball that far, you deserve to be on the dance floor. No. 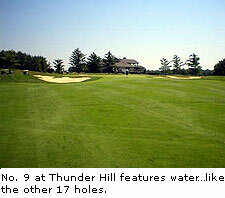 9 at Thunder Hill Golf Course, Madison. Hey, you have to include a hole from one of the baddest courses around, the 7,500-yard Thunder Hill course. You know a course is bad when they sell T-shirts in the pro shop that read: "I played the Thunder Tees and lived to tell about it." No. 9 plays 248 yards from the tips, 179 from the whites. Water intimidates more than anything else off the tee, but if your nerves don't get the best of you, clearing it shouldn't be much of a problem. You have two options here: hit for the green on the fly, ignoring the water and three bunkers that surround the green, or just carry the water and play a run-up shot through the vulnerable front opening of the green. I wish we all had the skills to consider multiple options.